This continues the interviews of weird/speculative fiction authors on the themes of Art & Beauty in Fiction. Tom Barczak is an artist/architect who delivers splendid adventure with interesting characters, a beautiful style, and a haunting medieval setting. His fantasy fiction is compelling and poetic, and saturated with angelic warfare. We corner him here to learn more about his heroic journey, his creative process, and the spirits motivating him. 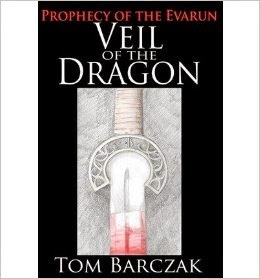 The cover of your debut novel Veil of the Dragon features a subtle, splendid weapon design. It displays the sword of your crusader-like Servian Knights who swore oaths to only strike at evil demons, and to be merciful toward humans so much as to not strike them. A symbol of their conviction was to cover their magic blades in fragile cloth. This was a great design that highlights the paradox of a military legion representing a benevolent religious organization. Was this based in history or was this a Barczak creation? TB: It was an image I carried in my head long before I even finished the story. Like a talisman. It carried so much meaning for me. Still does. In architecture there is a word we have, called a Parti. It is the essence." Your online Bio goes as: “My background is an Artist turned Architect who is finally getting around to finishing those stories I started writing when I was sitting on my front porch as a kid.” Of course, you are also illustrating those stories (see http://tombarczak.com/sketches.html ). Given the poetic, fantasy milieu you created, I picture your childhood porch as the gateway between Dante’s Inferno and Purgatorio. What was your early muses and porch-studio like? Was that porch haunted? TB: Hehehe. Nope. No gargoyles on my porch. Just pretty much a normal porch. Problem was I’ve never done very good with normal. A large portion of my childhood was me wishing I was someone else, doing something else, somewhere else. I always had a hard time just being where my feet were. Basically I was just a weird little kid. And I would just sit there for hours just making stuff up. Clearly you’ve had stories brewing in your head since childhood, and have develop a portfolio of artistic talents along the way; so your thoughts have been growing simultaneously with the tools you used to capture them. What type of art did you create prior being an architect? Does your architecture background inform your planning of a story? Do you plan all your work to be illustrated? TB: For a long time, particularly during my art school / college years, my painting was therapy for me. It was the only way I knew to take those places in my head and make them real. It was very dark. But it was like magic. It let me have some control over my feelings, instead of just getting swept away. But, looking back, I think that control I thought I had was only an illusion. What it did, was help my outsides match my insides a bit, which for the moment at least, would give me a little peace. The illustration I do now is just that, illustration. Not nearly the cathartic work I sought in my paintings. As for my writing and architecture, well, that’s an entirely different thing altogether. I believe that part of me allows my stories to have structure. And it also gave me an important tool. I tend to write with brevity. Very few words compared to what I see others do. Almost like a movie script. But a novel needs a bit more flesh than a movie script. So when I finish a piece, then I get to go back and do what I call, painting between the buildings. At least for now, I intend to illustrate my books. It’s hard for me to separate the two. But I understand it may not be appropriate for everything either. Until I read your work, I had not stumbled across religiously-inspired fiction since C.S.Lewis and J.R.R.Tolkien (fantasy also derived from Christianity). As a die-hard agnostic, I thought the delivery of The Veil of the Dragon was wonderfully obscure; any audience can enjoy it (see review) . Even though it is far from a controversial novel, I imagine that ultra-conservative religious folk may think it improper to dream up fantasy evolutions of religion…just as paranoid atheistic readers may fear they may be subverted into being exposed to religion involuntarily. Conversely, does the process of creative writing evolve your own faith? TB: The biggest criticism I’ve ever had regarding my work has had had to do with the undertones of religion there. I don’t feel particularly bad about that. I certainly have no intention of converting anyone to anything. Nor is it any of my business what someone else believes. Fact of the matter is I have to write what I know. I’m a Catholic and a Christian, but most of my faith I learned outside of a church. I’ve had the benefit of good teachers in my life. Men and women who taught me how to live a life based on principals and not on how I felt or thought at any given time. They continue to teach me to live a life not based on self, but one of being of service to others. I get to live a spiritual life today. It’s solely because of that, I believe, that I even get to write today. So yes, some of that gets into my work. Anything less wouldn’t be the truth. And as a writer, I have to tell the truth. Just how allegorical is it? Avoiding spoilers, can you clarify if specific people/ideas are re-casted in the book? Or is your more work more metaphorical and generalized? Any design strategies for those wanting to create allegorical fiction? TB: Some of what I discussed above. A big influence as well, was the death of my daughter, Olivia, when she was 2 ½. I think because of that, as well as some of my own other trials, I can’t not write about loss and love, death and rebirth. It’s very much a part of who I am. As for strategies, tell the truth. Doesn’t matter what your beliefs are. Everyone has their own Heroes Journey. Tell it. And if you’re still on it, finish it. Then tell it. Is it enjoyable or scary to capture evil in art? Do you find it therapeutic (or helpful to contemplate) unknown concepts (from the divine to evil) by turning them into art? TB: A few thoughts. One is I believe I have a mild case of synesthesia. My senses are a little cross –wired, so sometimes I describe colors as smells and tastes as sounds. I think some of that comes out as a sensual quality of my work. The second one is that I absolutely believe evil can be just as beautiful as good. Often it’s more so. Check out the Screwtape Letters by C.S. Lewis. Ever really looked at a black widow? Maybe not evil, but it’s certainly as beautiful as it is deadly. It’s captivating. Bad is always going to look cooler than good.We’re drawn to the fix not consequences.And yes, it is therapeutic. All of it. It’s coming out of darkness that we best appreciate the light.It’s hard to appreciate heaven until you’ve been through hell. Thanks to you, Tom, for sharing your soul in novels, art, and this interview!